This is a quick stir-fry to serve with most Indian meals. It is DELICIOUS! This recipe is from At Home with Madhur Jaffrey: Simple Delectable Dishes from India, Pakistan, Bangladesh, and Sri Lanka. I have several of her cookbooks, and they are all wonderful. 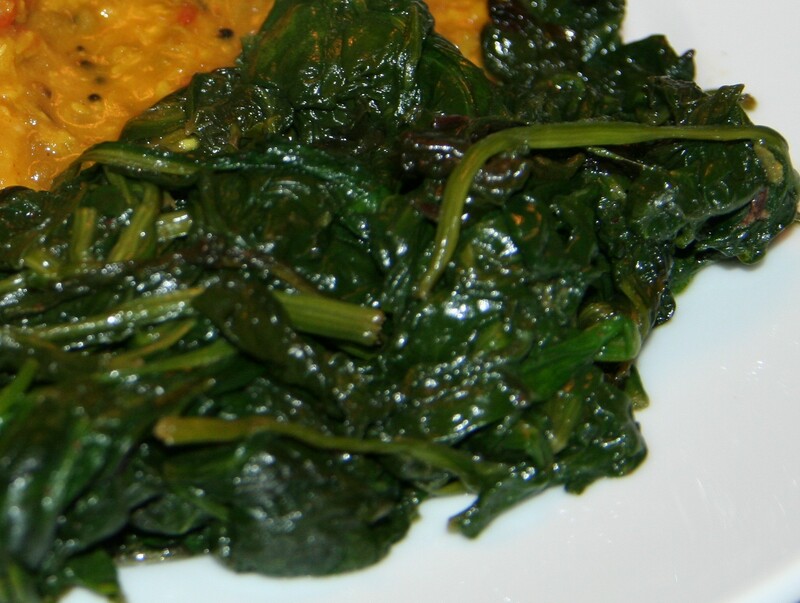 We ate this side dish with Chilkewali Mung Dal. I substituted one tablespoon of canola oil with coconut oil, and added extra garlic. Wash the spinach well and chop coarsely. Leave to drain in a colander. Pour the oil into a wok or large pan and set over medium-high heat. When hot, put in the cumin. When it sizzles, add the garlic. Stir until the garlic slivers turn golden. Add the spinach, stir and cover the pan. When the spinach has wilted completely, remove the cover and add the salt and cayenne. Stir and cook on high heat, uncovered, until most of the liquid has boiled away.